Cheap First and Business Class Flights to Washington, D.C.
Business Class Flights to Washington, D.C.
Start your journey with our business class flights to Washington, D.C. Our personal travel specialists focus on delivering a tailored service which finds you cheaper business class flights and creates the first steps for us to build long lasting relationships with you or your company. Our superior service means we can make the process of organising your business class flights to Washington, D.C. hassle-free. From business trips to a luxury holiday, we arrange all the flights, airport transfers, hotels, and car hire to suit you. 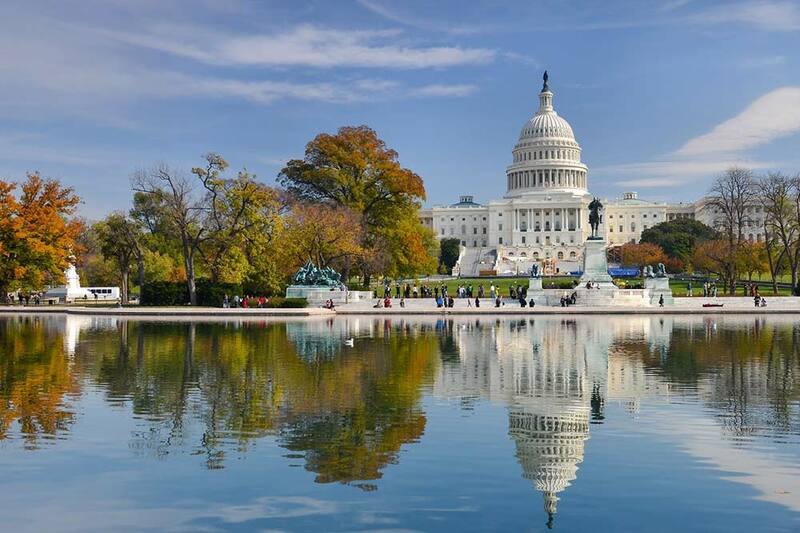 Whether for business or leisure, your personal travel consultant will be able to find you the best business or first class flights to Washington, D.C. for your needs. A trip to the capital of the United States of America would not be complete without visiting the most famous house in the world, The White House. 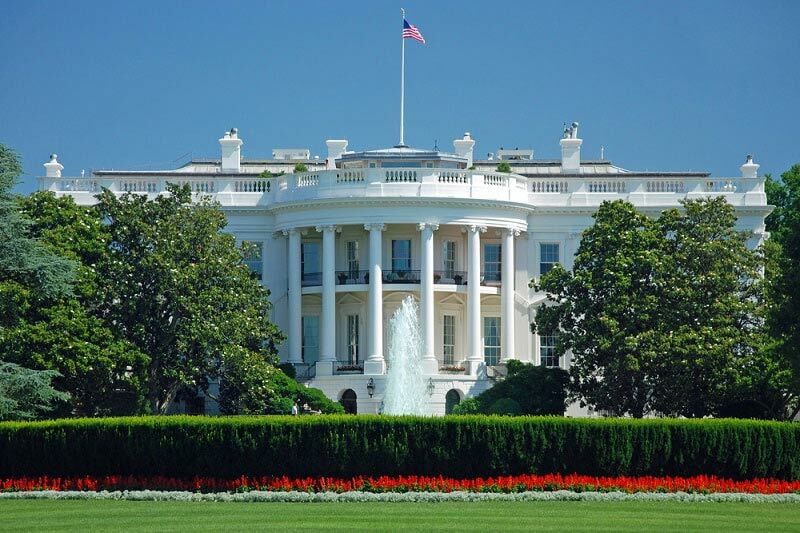 Located at 1600 Pennsylvania Ave, the building has been home to the President of the United States since 1801. The front façade faces the National Mall and the famous Washington Monument and offers views of the White House across the south lawn fountain. The triangular portico on the north façade that is depicted on the $20 bill is viewed from the pedestrianised street near Lafayette Square. Insider’s Tip: Tours of the White House are difficult to organise for Non-US citizens but can be done if time permits from the UK Embassy in Washington, D.C.
Across the Potomac River and with a direct line of sight along Memorial Drive from the Lincoln Memorial, Arlington National Cemetery is a poignant and sombre space devoted to the US military personnel that sacrificed all for their country. It is easily accessible on the city’s metro system and remains a tranquil place that has been depicted in major motion pictures such as Saving Private Ryan. Amongst the neat lines of the fallen, those interested in US history will be able to visit the Tomb of the Unknown Soldier, the only child of Abraham Lincoln not to be buried in Illinois, and John F Kennedy’s grave. Across from the cemetery is also the Pentagon with a memorial to the 9/11 incident. Insider’s Tip: An interpretive bus tour can be taken throughout the grounds with commentary on major sites and provides a fascinating and informative insight into this iconic landmark. Stretching from the Lincoln Memorial in the west to the Capitol Building in the east, The National Mall contains nearly all the “big ticket” things to see and do in Washington, D.C. With lakes, museums, memorials, monuments, and iconic landmarks; a day can easily be spent wandering the surrounds. The west portion of the grounds contain countless memorials to brave men and women of conflict, as well as the Lincoln Memorial and Reflecting Pool that leads to the Washington Monument. This is the famous site where, on the steps of the Lincoln Memorial, Dr. Martin Luther King Jr delivered his momentous “I Have A Dream” speech that helped change the course of history! 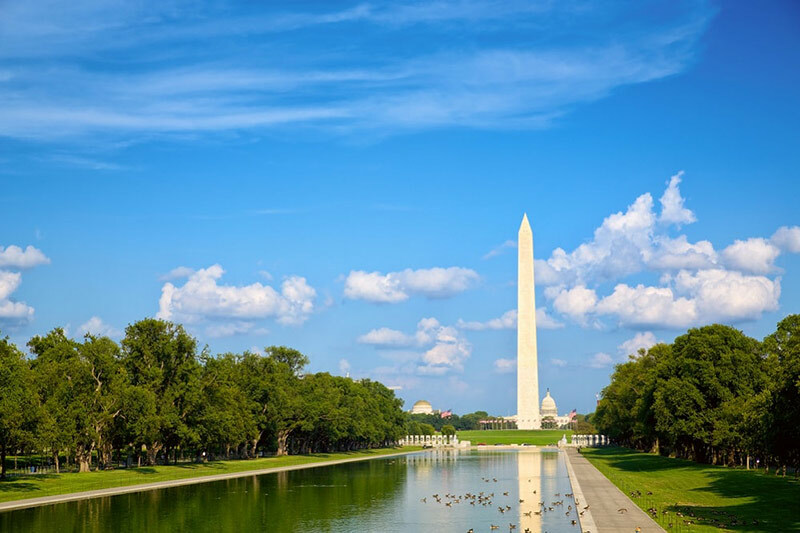 To the east of the Washington Monument, The National Mall is lined by no less than eight museums and galleries, ranging from Smithsonian Museums of American History, Natural History, American Indian, African Art, and the Air and Space Museum; as well as the National Gallery. With free entry you can get lost for hours in what is commonly regarded as some of the best cultural spaces in the world. The National Mall ends in the east with the gentle climb towards the Capitol Building, the home of Congress in the US, the front of which is known for the inauguration speeches of the President of the United States. With the Supreme Court and the Library of Congress directly behind, the architectural significance of the area is indisputable. Insider’s Tip: A free tour is available of the Capitol Building offering an excellent opportunity to see areas not open to the public. These often fill up in advance, especially around major holiday times in the USA, so booking online in advance is highly recommended. Situated a couple of blocks from the White House, Ford’s Theatre is a great opportunity to experience a significant moment in history, the 14th of April 1865. The location is the setting for one of the greatest crime stories of all time, the assassination of Abraham Lincoln in the Presidential Box during the last act by John Wilkes Booth. While tours are available, the best way to immerse yourself in the history of this theatre is to see one of the performances of “One Destiny” that relives the fateful night. Located walking distance to all the city’s major landmarks, the Mandarin Oriental offers fantastic business facilities for all your company’s needs, including several meeting and conference rooms with the latest technology. Washington, D.C. marks the southern end of the major cities along America’s Eastern Seaboard that stretches through Baltimore, Philadelphia, and up to New York. Travelling between these cities is easy by both car and Amtrak train making for an excellent multi-city luxury holiday. 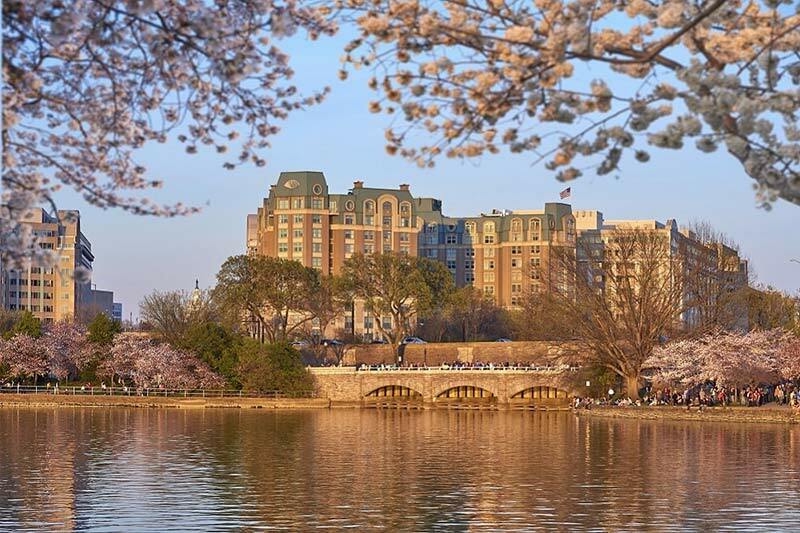 Famous for its role in the American Civil War and the site of Abraham Lincoln’s Gettysburg Address, this town 1 ½ drive to the north of Washington, D.C. is an excellent day away from the capital. Steeped in history, the best way to experience the area is on a day tour. Fly From = Direct from London Heathrow.